The Play! By Sephora box is a beauty subscription service that is $10 per month and includes 5 deluxe beauty samples and a perfume. 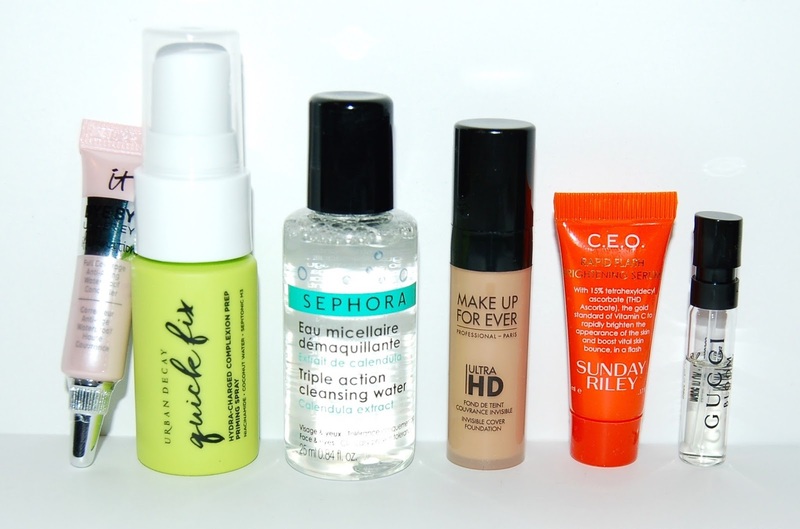 Every sample is from a high end brand that is sold at Sephora. The samples come in a cloth drawstring bag. You can sign up HERE. 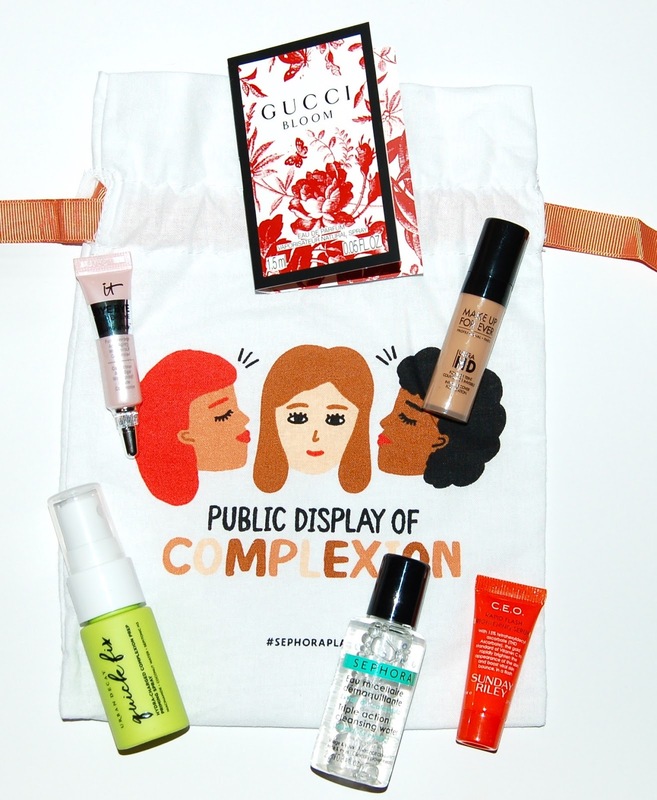 The theme for this month's box is Complexion Companions which means that we'll be getting items that will get us a flawless makeup look. This is a pore-minimizing priming spray that is infused with coconut water for hydration and skin soothing benefits. This spray feels really refreshing on the skin and smells like the beach (because of the coconut scent). I tried this under foundation and I can't really say that it did much. I'll keep trying it under various foundations. I've tried this foundation several times over the years and it's not my favorite but it's not bad. The shade I got is a bit dark, but I can make it work. This is a waterproof and super thick concealer. I have the regular version of this and it has a TON Of coverage. That said, I don't love it because it truly is insanely thick so it tends to crease pretty badly on me. This "illumination" version is a lot more pink toned. This is a vitamin C concentrated serum that brightens, smooths, and hydrates the skin while reducing the signs of aging. I'm excited to try this because I love Sunday Riley's Good Genes. I'm also excited to try another vitamin C based serum because I'm currently loving the Ole Henrikson Truth Serum which is also vitamin C based. This is a no-rinse micellar water cleanser that removes makeup from the face and eyes in one swipe. I haven't tried many micellar water cleansers so I'm excited to try this one. This perfume smells like a beautiful field of flowers! I absolutely love it. I actually really like this month's Play! By Sephora box! I will use every single item which is a first I think! If you'd like to sign up for the Play! By Sephora monthly box, you can click HERE, I don't think there is a waiting list anymore! This post contains affiliate links. I will be compensated if you make a purchase after clicking on my links. Thanks for the support!